While the earth should be celebrated all year round, it’s that time of year when more people than usual are celebrating this incredible planet we live on. 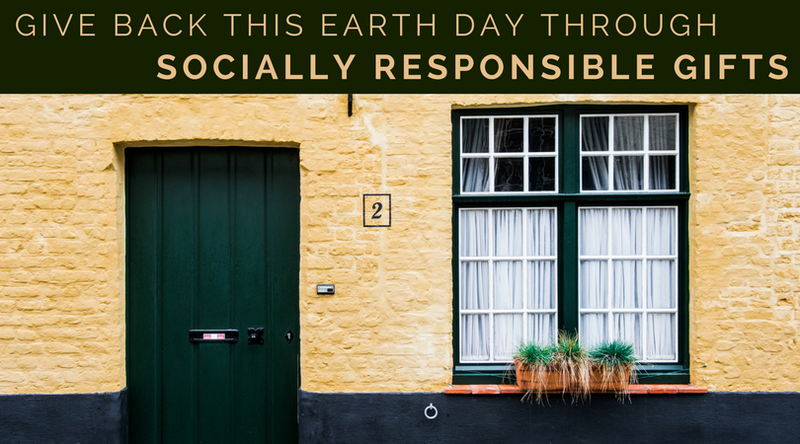 This Earth Day, give back to help protect our environment and the people living in it around the world. Whether you’re treating yourself or gift giving, these socially responsible gifts are clear winners to both the recipient and the local communities in which they are making an impact. Give back to the local communities, animals, and the environment simply by booking your hotel through Kind Traveler and choosing to make a donation to one of their charities, and you’ll also earn a special discounted hotel rate for doing so. 100% of each donation is given to charity. Giving back to the local communities you’re traveling to has finally become easy, even on busy business trips! Different than your typical tour company, Urban Adventures offers small group day tours around the world that are all run by locals. They are supporting the local communities and participants get an authentic local experience to really connect with the destination. There are an incredible amount of high quality teas in Nepal that are not common to find in western markets, but Nepali Tea Traders is on a mission to change that. You can now buy all kinds of Nepalese teas from them while knowing that your purchase helps to build a sustainable tea economy in Nepal. I probably don’t need to spend much time convincing you to drink more wine for a good cause. For every bottle purchased from One Hope Wine, half of the proceeds go to their partner charities supporting causes such as clean water, global healthcare, childhood hunger, and breast cancer. Different from a traditional micro-loan platform, through Womentum you can make a donation to women entrepreneurs in developing economies to help them grow their micro-businesses. The entrepreneurs receive 100% of the crowdfunded amount, and once they are successful they can then pay it forward by donating some of their profits to help other women entrepreneurs. Through Kiva, you can lend as little as $25 to help a borrower achieve their goals — you’ll find everything from going to school to starting a business to accessing clean energy. You will then get paid back (they have a 97% repayment rate) and can reinvest those funds in another budding entrepreneur. Read up on the full #littleBIGthings interview with Kiva for more details. More than just a piece of jewelry, Lokai Bracelets support a good cause and are a constant reminder to stay grounded. Each bracelet has a white bead that contains water from Mount Everest to remind you to stay humble when you feel on top of the world, and a black bead with mud from the Dead Sea to remind you to stay hopeful when you’ve hit a low. Not just any bracelets, Wanderer Bracelets support the artisans in Bali who made them. Each bracelet is made with all natural repurposed water buffalo bone and is hand woven with durable nylon thread, and they’re meant for stacking so get a few of your favorites instead of just one! Use code MARISSASUTERA20 for 20% off your order! Celebrate bravery and empower women around the world with jewelry from the Brave Collection that is handmade in Cambodia by local artisans. Many of these artisans are mothers, either working in a Cambodian studio or from home while caring for their children. To get out of poverty, BeadforLife knows that women need confidence and business skills. They offer business training and mentoring so women can start businesses that will sustain their families. 81% of the women who start a business in the program are still successfully running that business two years after they graduate — that’s a pretty amazing sucess rate! The jewelry and other products sold by BeadforLife are made by women who are talented artisans and have graduated from their business program. Bracelets and other products from Life Out of the Box (LOOTB) are handmade by artisans in either Nicaragua, Guatemala, or Morocco and help provide school supplies to children in need. They also sell beanies that provide nutritional packets and t-shirts that each provide seven meals. Their products are especially unique because each one has a custom number on it that you can use to see the contribution you are making through a video of the project you helped give school supplies to. 65 million girls around the world are denied the right to education. Your purchase from Faircloth & Supply provides access to education for girls in Nepal. Each item sold provides a school uniform to a girl in Nepal, making it possible for them to obtain an education. Your FAVORITE pants just got the update they (and you) deserve. Introducing: The Stretch Collection. We thought we couldn't make a more comfortable pant but we were wrong… SO wrong. Our new Stretch Harems and Stretch Loungers fit just like the originals but now they're stronger, softer, and have the perfect amount of stretch to give your legs the room they desire. Link in the bio! With the alarming decline of elephants in the wild, The Elephant Pants were created to end the exploitation of elephants. For each purchase, a portion of the sale is donated to global project that support elephants, like organizations that reduce conflicts between humans and elephants, protect the wildlife, and support research to cure elephant diseases. Beautifully hand-crafted by artisans in Sub-Saharan Africa, this @roseandfitzgerald Raw Wood Charcuterie Board is a perfect centerpiece for any dinner party. We’ve curated home favorites like this in our new home collection. Link in bio. This marketplace provides you with the opportunity to buy products from brands that work directly in community development in destinations worldwide. Your purchase from Enrou will support the artisan who made the product as well as community initiatives like financial coaching, health education, and women’s empowerment programs. Each candle purchased from Prosperity Candle supports women entrepreneurs and provides wages for women who have recently resettled from refugee camps. These women are now living in the United States, working to create brighter futures for themselves and their families. All Oliberté shoes are made at their factory in Ethiopia, where they partner with local suppliers, farmers, and craftsmen and employ locals for fair pay with worker’s rights. They are the world’s first Fair Trade Certified™ footwear manufacturing factory, so your purchase can go a long way in helping to improve an entire community. The laptop and travel bags made by Ethnotek are created with ethically sourced handmade textiles that employs weavers and artisans in Ghana, Guatemala, India, Indonesia, and Vietnam. The underlying part of their mission is that we should all celebrate each other’s cultures and differences more often, learn about them, and ensure their survival by retelling their story. Now that’s a mission I can stand behind! Have more socially responsible gifts to add to the list? Leave them in the comments below! So happy to see One Hope Wine on this list! Not only do I love how they give back, but I adore their wine! I bought an entire case of their Brut after I tasted it the first time! Thank you for the great research and information!